Had the distinct pleasure of interviewing a talented young man the other day on Urban Nation LIVE, a Minnesotan rapper who performs under the mantle of Tall Paul. His video for the track “Prayers in a Song,” performed at a 2010 pow-wow near Leech Lake, MN, caught my eye and ears for its seemingly impromptu feel, balanced off by the self-assured flow of lyrics. Below is the UN interview, preceded by a transcription of the introduction. My next guest has proven just how flexible and compatible hip hop and Aboriginal languages can be. And no further proof of this ‘fuseability’ is needed than a YouTube video making the rounds in Indian country on-line. In his track entitled ‘Prayers in a Song,’ rapper Tall Paul of the duo Point of Contact lays down some bilingual lyrics in Anishnaabemowin and English. And here to tell us more about himself, the song and the inspiration is the man himself, Tall Paul. I’ve never seen or heard anyone rap in a native tongue before. 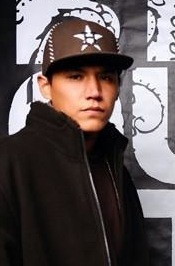 He’s the first Native American rapper that I’ve seen.